After reviewing several solutions the Accord LMS was clearly the best combination of features and functionality – and it was the most cost effective. Accord has provided exceptional customer support as well. Extended Enterprise for Partners, Franchisees, etc. What is Active Learner Pricing? 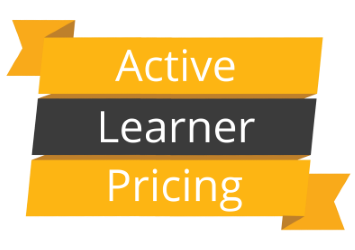 Active Learner Pricing is a licensing model that insures you are only paying for Users that are actively engaged in learning. All Accord licenses allow for an unlimited number of Registered Users to access your portal and use many of the site features and some of LMS features without any fees. A User is considered an Active Learner when they utilize learning content that is tracked and recorded. After a period of inactiviy the Learner is no longer considered Active and does not count towards your license's Active Learner count limit. All Accord licenses allow for an unlimited number of Registered Users to access your portal and use many of the site features and some of LMS features without any fees. For example, Users can login and navigate the site; access learning communities, transcripts and untracked learning resources delivered by the LMS. In addition there is no limit on the number of LMS Administrators or their admin activity and report access. If a User utilizes learning content that is tracked and recorded they are considered an Active Learner and count towards your license's Active Learner count limit. Can I host the Accord LMS on my own server? Absolutely. While we recommend our affordable cloud hosted solution for convenience and reliability, we can install the Accord LMS directly on your servers. We are committed to providing the highest quality of customer support. That starts the day you contact us and continues through evaluation, implementation and maintenance. As part of every new account setup, a solution engineer will configure the Accord LMS to address your branding, training objectives and work flow. They will also provide plenty of one on one training. You'll be surprised how quickly we can have you ready to smoothly roll out your new LMS. Your success is our success and we're here to back you up all the way.